Knotting, Lacing, Inlay, Twining, Couching (faux), Hemstitching: amp up your knitting with these 6 afterthought embellishing techniques! That single skein of pretty sitting in your stash can add pizzazz to plain knitting (hand-made or store-bought! ), lace in a waist taper, or cover up an extended edging. You will practice all these techniques in class, as well as get ideas for using and extending them. Come learn to KLITCH! Cast on, knit, purl, bind off; follow written instructions, simple stitch patterns, incs/decs, yarn overs. 70 yds worsted (#4) plain yarn in 1 color (A); 50 yds in complementary multi-color or handpaint (B). Small amounts of embellishing yarns such as narrow ribbon, thick-n-thin single-spuns, handpaints. With A, cast on 30 stitches. Rows 1-16 Knit 4 rows; work 12 rows stockinette stitch. Rows 17, 20-21 [P2, k2] to last 2 sts, p2. Rows 18-19, 22 [K2, p2] to last 2 sts, k2. Rows 23-4 Work 2 rows stockinette. Rows 25-44 [Knit 4 rows; work 4 rows stockinette] twice; knit 4 rows. Rows 47-60 [Work 2 rows seed stitch, 2 rows stockinette st] 3 times; work 2 rows stockinette. Rows 61-68 [Work 2 rows seed stitch, 2 rows stockinette] 2 times. Rows 69-80 Knit 4 rows; work 4 rows stockinette; knit 4 rows. 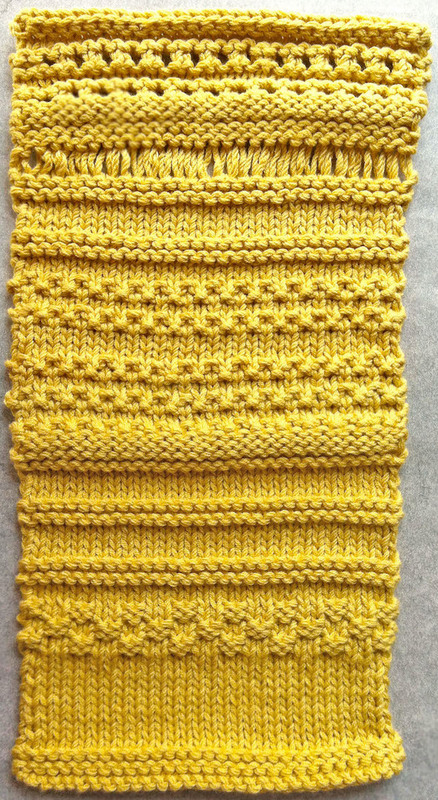 Row 81 K1, [wrap yarn around the needle twice between stitches, k1] to last stitch. Row 82 Dropping yarnovers off needle, knit (tug so extra length goes into stitches). Row 89 K1, [yo, k2tog] to last stitch, k1. Rows 95-100 Repeat Rows 89-94 once.